Photo by Jason Nolan, Plymouth -through Flickr 'Blog this'. 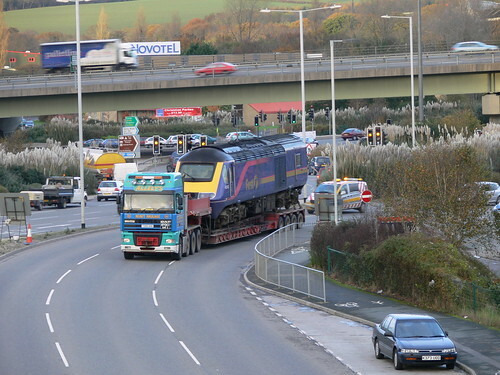 I came across this picture of a First Great Western 125 on its way passed Sainsburys, only this time by road. Click the photo itself to go straigh to the image on the photographers Flickr account for some of the comments - priceless! Click here to visit his Plymouth Set - and then click the View as Slideshow link top right and sit back and enjoy!